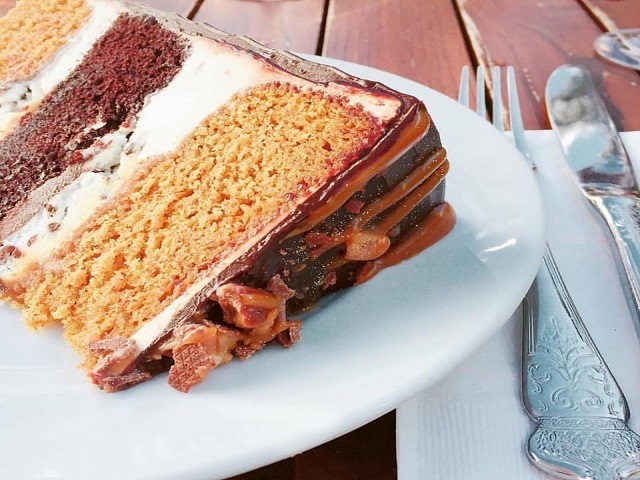 INDIANAPOLIS – One of the most popular cake shops in the state is right in Indianapolis, and they’ve whipped up treats for people all across Indiana – including visiting celebrities. “The last cakes that I made were for Trisha Yearwood and for Garth Brooks,” said owner and founder of The Cake Bake Shop, Gwendolyn Rogers, who mentioned she was determined to make her dream come true. Her self-taught baking and cooking skills paid off. "Failure was not an option for me. I knew every day that I got up, I had to do something that would get me one step closer to where it is that I needed to be, to make sure this would open and be successful,” said Rogers. All the recipes come from Rogers’ creativity – including the homemade jams, blackberry cake, and homemade shortbread and chocolate cake. Staff makes everything from scratch. “All of our carrots for our carrot cake are hand peeled and hand shredded,” she said. The Cake Bake Shop, in Broad Ripple, not only serves cakes, other desserts and lunch items, it serves up style. Rogers said the shop is a mix of her passion for baking and interior decorating. This year marks the shops’ third anniversary, and a second, and much larger location will open in Carmel in 2018. Learn more about The Cake Bake Shop here.